Today I wanted to share the gift I made for my sister and brother in law for Christmas. I always have a difficult time deciding what to get them for Christmas but this past year I knew what I wanted to make for them. One day when I was in Goodwill I found 4 glass cabinet doors and I knew I could make something out of them, especially since they were only $2 each and I actually had envisioned the project in my head when I bought the doors although I wasn't sure about the vinyl design at the time. My friend Karen was here when I made the project and she helped me out by doing the painting while I worked on a design I liked. I had gotten knobs at Hobby Lobby a long time ago for the project so at least that part was taken care of and I didn't have to go shopping for knobs. When I do vinyl on glass I generally always put it on the back of the glass so the front can be easily cleaned when needed and the vinyl design is safe from somehow getting messed up. I cut some templates from white cardstock and used a re-postionable Herma Dotto roller to put them on the back so my sister could easily cut pictures to size. 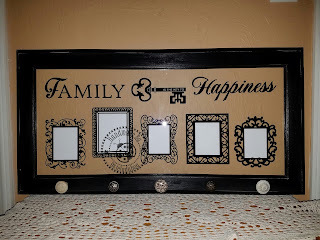 I used some double sided tape along the frames so pictures can be added, all she has to do is pull the paper off the tape and place her picture in the frame. She and my brother in law seemed to really like the gift. I asked them a few weeks ago if they ever got it hung up and my sister said they hadn't and my brother in law said it was because she hadn't told him where she wanted it and she then said she did tell him...and then I was sorry I asked! *okie cracks up laughing*. I gave one door to my friend Carmen when she was visiting one time and then I used another one for a wedding gift, which I will post later on and that leaves me with one more door to alter and I really wish I had a few more of these because they really turn out nice. So when you're out shopping in thrift stores always remember that even the oddest things can be made into something else! This is a lovely idea for a gift. I am new to the vinyl project world (as in I have never given it a try) so is there a specific type vinyl you would use on glass? I have only read a few things about different vinyls and it was overwhelming! I use the permanent vinyl, for this I used Endura gloss which is comparable to Oracle 651. Proof positive that "one man's trash is another man's treasure" (or woman's treasure if you prefer). And this is truly a treasure. Shirley, I love how your creative mind works. I'm not sure how many people might have seen these glass paneled cabinet doors and visualized them as amazing frames, or that even if they had, that they would have been able to decorate them so beautifully, but YOU did. 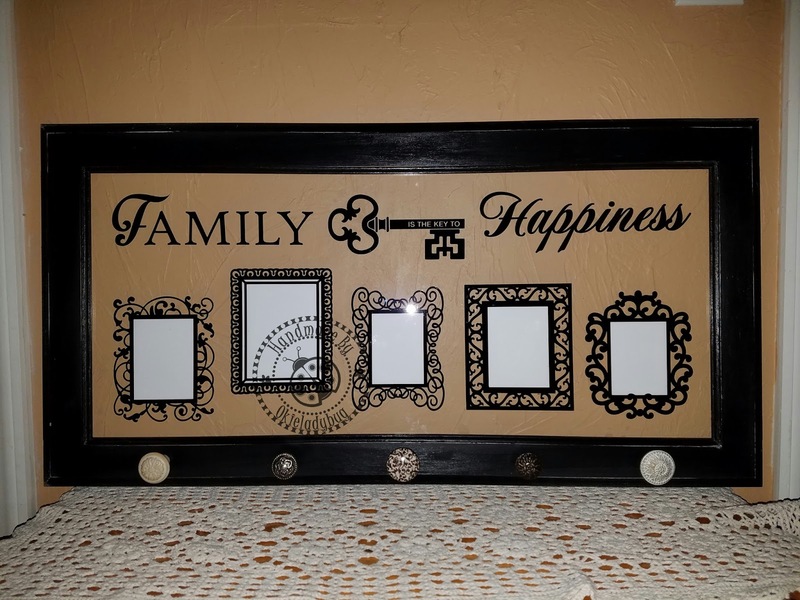 Loving that you made each individual frame a different design ... somehow they work together so perfect and will allow each individual picture to have it's own personal character. I really like that sentiment with the key and the fonts you used too. What a unique and fabulous gift idea.